Wall-mounted Ethernet switch, how to install? I have a wall-mounted Ethernet switch that is supposed to be mounted partially inside a wall or panel. 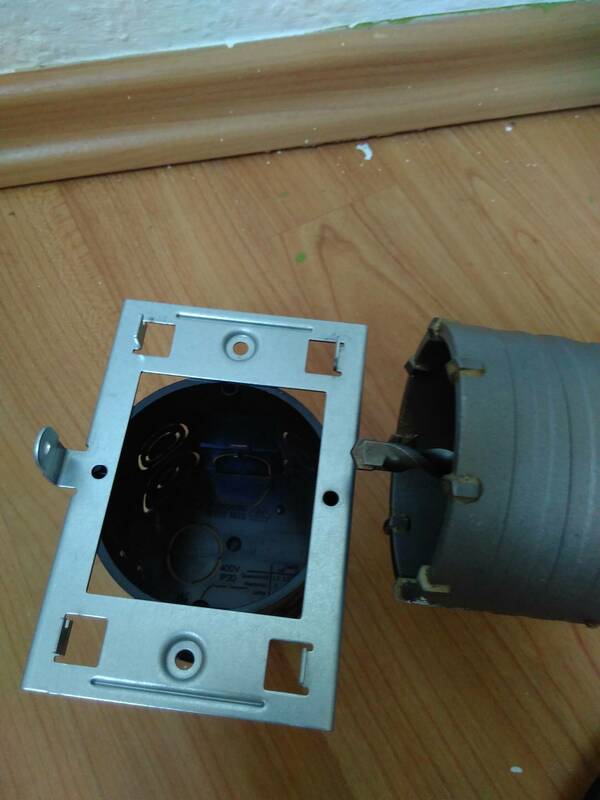 There is a mounting bracket included that would fit a standard 60mm can, however the switch does not fit in there, as it uses the rectangular area of the mounting bracket. My suspicion is that this is a collision of a product for the US market with German wiring standards. How would I mount such a bracket to a wall properly, leaving a close to rectangular space inside the wall below the opening (the switch doesn't protrude far into the wall, 1cm should be enough)? How to drill a hole in a partitioned wall? Are there devices to find pipes in walls?